When it was announced that Marvel's followup to Spider-Man 3 would be Iron Man, fans were rather disinterested. A hero that's barely been able to hold down his own book in the last decade? And it's being directed by Jon Favreau? The dude from Swingers? Foggy Nelson in Daredevil? Can he even direct? Who greenlit this trainwreck? But then... then things started to change. Joe Quesada admitted in an interview that Iron Man was the movie he was most looking forward to, at a point when the "corporate shill" answer would have been to hype Spider-Man 3. The cast started to fill in. Pictures started to leak out. Favreau proved himself to be as big a geek as anyone. By the time a teaser trailer was shown during the Super Bowl, fans were absolutely amped, and now we have our first action figures from the line. During his captivity, Tony Stark constructed a primitive repulsor tech device designed to protect his heart from the shrapnel embedded in his chest. Desperate to escape, he used that very machine to power the original Iron Man armor, risking his life in the process. He later improved on the design of his RT chest plate, and the armor to make both more powerful and efficient. This figure is the confusingly named "Prototype" Iron Man, which makes it sound like it should either be the very first armor he built, or maybe the version in between that and the "real" armor. But those are, according to the movie, the Mark I and Mark II, respectively. Why, then, does this look like the final version (the Mark III)? Really, "Secret Identity Iron Man" would have been a better name, since the immediate appeal of this figure is that it's our opportunity to get a Tony Stark figure. 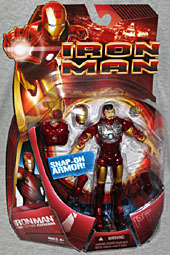 In the package, the figure looks like we've interrupted Tony in the middle of getting dressed. He's unmasked, the suit's chestplate is missing, and he hasn't put his gloves on yet. The detail on the hands is a bit soft, but not terribly so: they just look like an action figure's hands instead of small human hands. 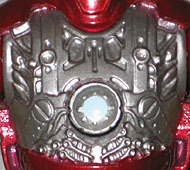 The exposed chest is metallic gray, with lots of intricate detail that is, thankfully, sharper than the hands. There's a big hole in the center of his chest that can accommodate one of two plugs - the device that keeps his heart beating. 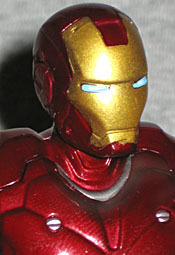 The likeness is pretty good; not quite on par with ToyBiz's movie figures, but still recognizable. There was some question whether Robert Downey Jr. was the right choice to play Tony Stark, but it's not really that strange a choice: Tony Stark needs to have a small element of the young Howard Hughes about him, and that's something Downey can definitely bring. Doesn't hurt that when he walked out on stage at SDCC '07 in a double-breasted pinstripe suit and tinted glasses, the physicality was unmistakable. The figure's eyes are just a little too high on his head (or else his head is too flat), but the way his hair is mashed down is nice: he's got helmet head! The test of any figure with removable armor is how "complete" it looks when all the pieces are in place. Ideally, you shouldn't be able to tell that the armor is anything but a normal, sculpted piece. How does Prototype Iron Man fare? Pretty darn well, honestly. 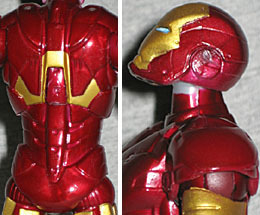 Stark's bare arms pop off where they emerge from the armor, and the gloves go on easily. Some fans were worried that the gloves would just snap over the hands, leaving one side bare, but that isn't the case. 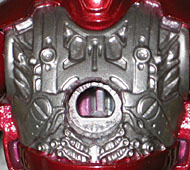 Despite what the back of the packaging suggests, the chest-plug goes in before the chest armor; more on that below. The plate is held in place by four tabs, and the helmet slips over the figure's head. Voila! Iron Man! 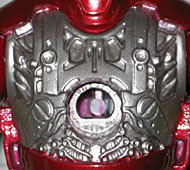 The only evidence that this is a removable armor figure is the severely sunken repulsor port, a glimpse of his chin under the mask, and a flash of silver at the base of the neck (from the underlying mechanisms). But hey, looking at the other IM figures, it seems that silver is supposed to be there, so someone seeing this figure on your shelf wouldn't have any idea that parts of it come off. 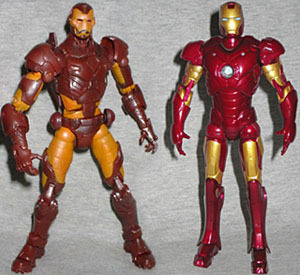 Marvel fans who missed out on Modern Armor Iron Man have been looking forward to the movie figures to fill that hole in their collections, since the movie suit looks so similar. Of course, there's a reason for that: the movie armor was designed by Adi Granov, the same guy who recently worked on the Iron Man book (and also inspired the Marvel Select She-Hulk). No surprise, then, that the print and live-action versions seem so similar. 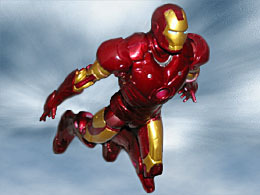 The suit is metallic red and gold, with blue eyes and just a little bit of silver near the shoulders and the toes. The armor is obviously constructed from various metal plates, overlapping and shaped to cover a human body. This isn't the classic Bronze Age version, which was basically large red chunks of armor over a yellow costume. In short, it looks more like an extremely high-tech version of military tactical gear than an extremely high-tech set of football pads. 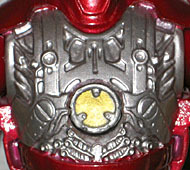 The suit is mostly a nice, dark red, with gold only appearing on the faceplate, upper arms and thighs. There's a bit on the back, too, but red is still the dominant color by a large margin. Proving that Hasbro has learned from their mistakes with the Spider-Man 3 toys, Iron Man stands 6⅛" tall - the perfect size for a guy inside a suit of armor. Articulation is nearly as good as any other Marvel figure: balljointed ankles, double-hinged knees, swivel thighs, balljointed hips, swivel forearms, double-hinged elbows, swivel biceps, balljointed shoulders, and a ball-and-socket head. The range of motion on that head joint is surprisingly limited; if you want him to look up, you have to pull the head halfway off the joint before you can tip it far enough. There are no wrists (on either set of arms), and no waist or torso joint, due to the action feature. in all the promotional shots of Stark building his armor, and a yellow one that's more like the repulsor seen in the comics. Will he switch in the movie? Who knows? Either way, it's a slightly problematic feature, because it doesn't always work right. The button, concealed on the figure's spine, is designed to push the pacemaker whatsis out of the chest. And that would be fine, except sometimes, the mechanism that actually does the pushing can get stuck under the plug instead of behind it: then, when you push the button, it tries to push up on the pacemaker instead of out, which accomplishes nothing, and leaves you to dig the damn thing out. Frustrating! But as long as you make sure everything's lined up properly, you shouldn't have any trouble. If all you want is an Iron Man movie figure to join your Marvel Legends display, you'll probably want the Mark III armor: it's more poseable than this version, what with the wrists and the waist and all. But if you want an Iron Man with a little something more, an Iron Man that's also Tony Stark, then you want thus "Prototype" version: the sculpt is good, the articulation is plentiful, and the removable armor is sweet. Just be careful with the pacemaker plugs, or you may get fed up. Hasbro's made some really good toys, here; now let's hope the film lives up to them.